Several practices of webscale companies are now penetrating mainstream enterprise organizations. The practice of DevOps is perhaps one of the most important. Driven by the adoption of cloud and modernization of application architectures, DevOps practices are fast gaining ground in companies that are interested in moving fast – with software eating everything - between "write code and throw it across the wall" to creating more pragmatic mechanisms that induce and maintain operational rigor. The intent behind DevOps (and DevSecOps) is quite noble and excellent in theory. Over the last two years Quali has conducted an annual survey that captures the trends at a high level from different vantage points. A survey fielded among 2,000 IT industry executives both online and during events such as VMWorld, Delivery of Things, Cisco Live, DevOps Summit, AWS re:Invent and Jenkins World provided several insights. Many of these were consistent with our experience. Other insights continue to surprise us. 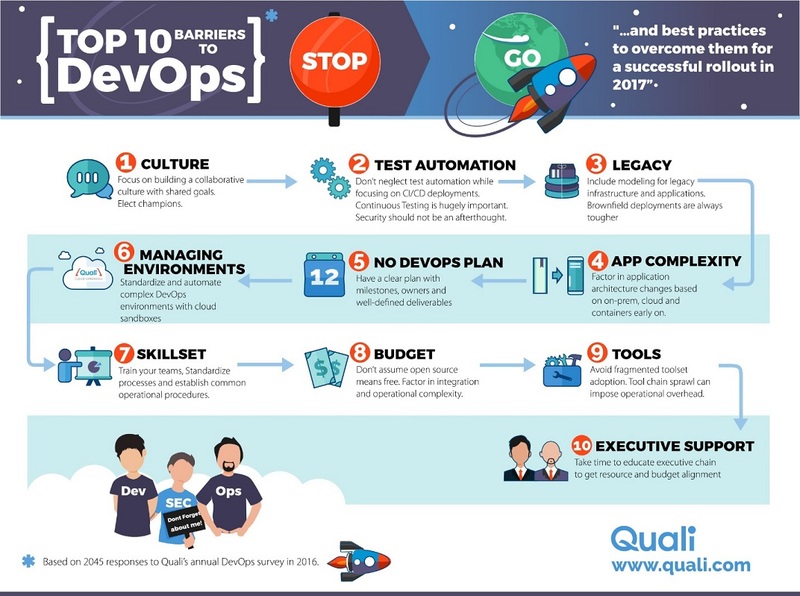 The survey also demonstrated some clear patterns on the top barriers inhibiting the rapid adoption of DevOps practices. The rankings were published in the infographic below. Check out more results from the survey. Shashi Kiran is CMO of Quali.